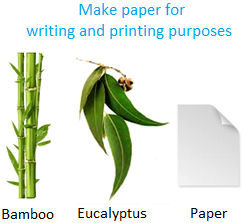 We will discuss about the different uses of plants. We know plants are very useful for us. There are many kinds of plants, bushes and trees in our surroundings. We enjoy various types of benefits from different types of plants. Let us know some of the following uses of plants. 1. Food: Plants are the main source of our food. We use different parts of different plants as food. 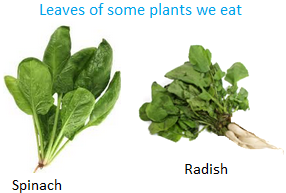 (i) We eat leaves of some plants like spinach, radish, gram, fenugreek, etc. The leaves are used as cooked or green food. They are rich in vitamins and minerals. 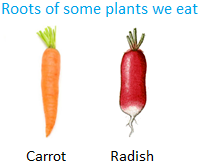 (ii) Roots of radish, carrot, cucumber, beet etc., are eaten as salad. (iii) We mostly eat cereals or food grains. The cereals are seeds of some plants belonging to the grass family. We prepare many types of food from the grains of rice, wheat, gram, barley, jowar, millet, maize, etc. Seeds of some plants are used as pulses like gram, yellow-gram, pea, green-gram, lentil, etc. Seeds of some plants are oily; oil is taken from the seeds like sesame, mustard, sunflower, etc. This oil is used in preparing many kinds of food and also for some other purposes. Ground nut oil, coconut oil, mustard oil, etc. are also used for preparing food. (iv) Fruits of some plants are used as food. These fruits are mango, grape, apple, orange, pine-apple, etc. These fruits are eaten raw, as they are tasty. They are juicy and rich in vitamins and minerals. Almond, chestnut, pistachio, raisin, etc. are used as dry fruits. (v) Some plants give us vegetables. Potato, tomato, turnip, ladyfinger, bean, pea, cauliflower, cabbage, pumpkin, bottle-gourd, etc. are some of the vegetables. They are cooked for eating. These vegetables are rich in vitamin, iron and other minerals. (vi) We get spices from plants. The spices give the vegetables good flavor and make them delicious. Coriander, pepper, clove, cumin, cardamom, cinnamon, etc. are some common spices to make the food tasty. (vii) We take coffee and tea. We get them from plants. Coffee is made from the seeds of coffee-plant. Tea is prepared from the leaves of tea-plant. 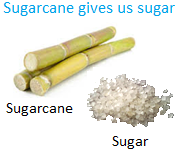 (viii) We get juice from sugar-cane. Sugar is made from this juice. With the help of sugar we make different kinds of sweet dishes, cakes, chocolate etc. 2. Medicines: Many medicines are made from plants and these plants are called medicinal plants. Neem, tulsi, brahmi, surpagamdha, banafsa, bail, etc. are known as medicinal plants. We use these plants to cure patients suffering from various diseases. 4. 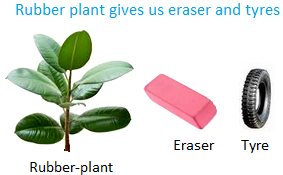 Rubber: Some plants give us gum like acacia, etc. We get rubber from rubber-plants. This rubber is used for making tyres for many vehicles. We erase pencil marks with the help of a rubber or eraser. 5. Wood: We get timber and fire- wood from trees. Our chairs, tables, doors, windows, etc. are made of wood. The wood of trees like teak, shisham, sal, etc. is essentially used to make different furniture. 6. 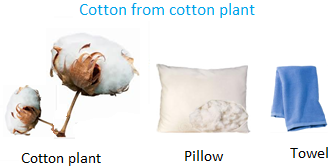 Cotton: We get cotton from cotton plants. It is used to make all types of cotton clothes such as bed-sheets, towels, etc. 7. 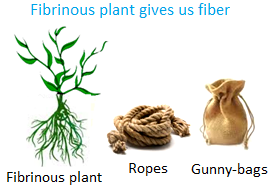 Fibers: There are some fibrinous plants to give us fiber for making ropes, gunny-bags, etc. Hemp, jute, etc. are such plants. 8. Perfumes: Flowers of certain plants are used to make perfumes. The flowers of rose, jasmine etc. are good for making perfume. Flowers are also used for different purposes like to make garlands and for other decorative purposes. 9. Pollution-remover: Plants and trees save us from air-pollution. Green plants take the carbon dioxide from the air in the process of photosynthesis and give back oxygen to the air. We breathe in oxygen from the air and given out carbon dioxide. 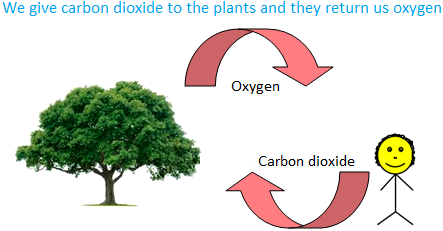 Thus, we give carbon dioxide to the plants and they return us oxygen. Hence air is saved from being polluted by carbon dioxide. 10. Manure: Plant wastes are used to make manure. This manure is utilized for the growth of other plants and crops. There are small and big plants that not only make our land green and pleasant but also help us in many ways in every walk of life.